A cinder-block basement and a stormy night is the setting for Waterworks Players production of The Charitable Sisterhood of the Second Trinity Victory Church. 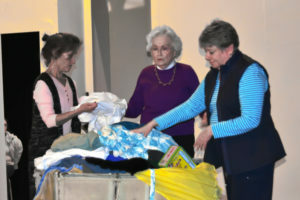 While the roads are flooded and the bridges are washed out, it takes a much greater tempest to prevent this group of church ladies from completing their sworn mission to organize a relief effort for homeless Guatemalans. Written by Virginia playwright Bo Wilson, this heartwarming comedy observes the sorting of a mountain of community donations by a devoted group of ladies. Each item is given careful scrutiny, after all, one woman’s junk is another woman’s treasure. Daphne Mason returns to the stage as Bea Littleton, the proud wife of Pastor Hiram Littleton who is happy to let you know it. Martha Womack is cast as Lorraine, a saint with nine children at last count and has lived in the community all her life. Valerie Wagoner is Tina Yates, a proud transplanted Yankee from the Baltimore suburb of Walbrook. Christy Leonard plays Janet, a cultured, new arrival from Georgia. Caitlin Mazura completes the cast as the young Riley, a stow-away who runs from one church charity event to another to escape her past. Waterworks’ Artistic Director Dudley Sauve is directing the production with assistance from Moffatt Evans (set designer), Linda Rofe (costume designer and production manager), Scott Chapman (light designer), and Chris Brochon (sound designer). The show runs February 9, 10, 16, and 17 at 8 pm. Purchase tickets: http://waterworksplayers.org/buytickets.